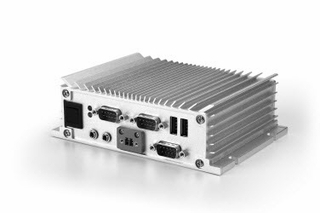 Able to operate completely fanlessly within a robust chassis, the VIA AMOS-3001 leverages the digital excellence of the VIA EPIA-P820 and EPIA-P720 Pico-ITX board to provide customers with an embedded system that delivers all the latest features and digital media standards required in today's increasingly multimedia-focused environment. Storage is provided through a 44-pin IDE interface for Disk on Module Flash drive while an optional storage sub-system expansion chassis offers support for a standard 2.5" S-ATA drive. An onboard RJ45 connector provides Gigabit networking while the VIA VT1708B brings HD audio. Additional features include four USB 2.0 ports, on board GPIO port, COM port and programmable Watchdog Timer. System LED indicators are provided for power and HDD activity.